Whether you’re an athlete or someone struggling to hit a fitness goal, meagrely the bathroom scale or a height-weight chart won’t do. You need to know what your body is made of and how it responds to nutrition and training. In fact your metabolic rate and body fat percentage surface much higher on the getting fit priority list. You can weigh 120 pounds (at 25% Body Fat) and still look bigger that an individual weighing 140 pounds (at 15% Body fat). The concept of “muscle weighs more than fat” is pretty much garbage. MUSCLE OCCUPIES LESS VOLUME THAN FAT. Remember the whole what weighs more a pound of iron or pound of cotton. One pound is one pound, irrespective. So what the hell is body fat and what’s all the hype about? In the simplest form, it’s the amount of fat stored in your body, compared to it’s other components, namely your organs, muscles, bones, blood etc. Having said that men and women tend to display different amounts of body fat. An elite male athlete may have a percentage as low as 3-4%. While an elite female athlete would carry 8-9% of Body Fat. You’re probably thinking about 0% Body fat now. 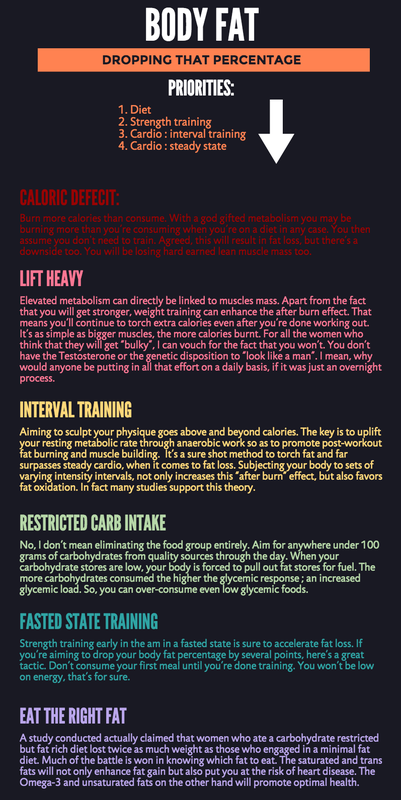 Well body fat is essential to survival and each and every person, ranging from the most ripped athlete to the average individual requires a certain amount of “Essential fat”. That’s the minimal amount required to survive. Fat serves as fuel when the carbohydrate stores are plundered. It even protects the internal organs. In absolute dearth, you put yourself at the risk of organ failure and other health risks. So with that attitude isn’t the 3-4% also extremely detrimental? What you need to understand is that most professional athletes maintain these low levels while competing or during season. Through the rest of the year, they maintain healthier levels of body fat to stay healthy and keep their internals in peak shape. Their livelihood depends on it and they themselves have a range of health care professionals around looking out for them at each and every step. Their bodies are conditioned and accustomed to working the way they do, without harming performance. However, if a non-professional aims to hit these minimalistic numbers, it’s most likely that his performance and strength might suffer. Like I’ve said time and again women face special concerns when it comes to training. If they don’t want to impact their menstrual cycles and fertility negatively, they mustn’t aim for a number lower than 15%. 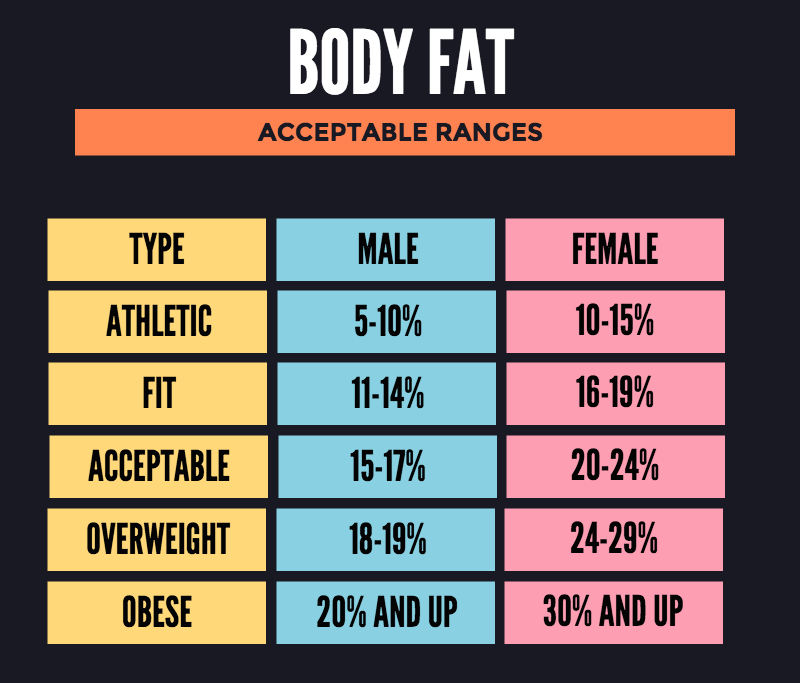 There are a number of available tools in the market to help you determine your body fat percentage. There’s Cadaver Analysis, Underwater Weighing, Bioelectrical Impedance, Skinfold Calipers, etc. However, most of them aren’t always accurate. The Manual Skin fold calipers often have the smallest margin of errors and are one of the better methods of gauging body fat. Around 50% of the body fat is under the skin. The thicker the skin fold; the more the fat the individual is lugging around. These callipers measure this thickness at specific body spots and substitute the values in a predetermined mathematical equation; to give you your reading of body fat. You’ve been told more than once, “Your body is 80% diet and 20% training.” While there is some truth to the fact, that healthy eating can drastically sculpt your body, you can’t neglect the importance of training. The lower you want your numbers, the more you’re going to have to give it your 100%. And yes, that includes both, your daily nutrition and training plan. Sooo if that’s all you need to know about body fat, what is BMI? You see a healthcare professional. He measures your weight, looks at your height and quickly charts out a ratio based on which he categorizes you as underweight, normal, overweight or obese. That’s your BMI (Body Mass Index). Shockingly enough, it isn’t always the best representation of your efforts or outcome. It will give you the same reading; whether you’re 150 pounds of muscle or 150 pounds of chips. Take a minute and think for yourselves. This methodology would put a 180 lb., 6 foot athlete athlete (10% body fat) into the same category as a 180 lb., 6 foot male (30% body fat). Just picture the two and you’ll be able to tell for yourself. BMI has its standing when you’re extremely overweight. It will signal your need to shed fat. However, once you get serious, train and eat well, it’s importance begins to diminish.